Episode 56: Are communities helped by terraforming food deserts? Bonnie Ghosh-Dastidar is a senior statistician and Director of the Statistics Advisory Center at RAND Corporation. Her current research interests center on leveraging natural experiment designs to estimate the effects of neighborhood-level 'interventions' or changes on residents' health behaviors (e.g. diet, physical activity) and outcomes (e.g. obesity). Her statistical expertise is in the areas of study design, survey methods, non-response, and analysis of longitudinal and multilevel data. Click to display or to hide the script from Episode 56. Rosemary Pennington : The Rand Corporation is a global think-tank which launched in 1948. The original purpose of providing analysis to the U.S. Military, and now conducts research and analysis for governments, universities and other organizations from all over the world. Rand's policy interests include children and families, national security, and health and health care among many other issues. Rand's health related research is the focus of this episode of Stats & Stories. Where we look at the statistics behind the stories and the stories behind the statistics. I'm Rosemary Pennington. Stats&Stories is a partnership between Miami University's Departments of Statistics, and Media, Journalism and Film, and the American Statistical Association. Our regular panelists are Department of Statistics' Chair John Bailer and Department of Media, Journalism and Film's Chair, Richard Campbell. Today's guest is Bonnie Ghosh-Dastidar. She's a Senior Statistician and Director of the Statistical Advisory Center at Rand. 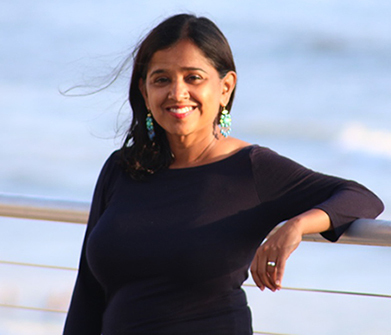 Ghosh-Dastidar's work has examined issues related to HIV, as well as Population Health and recent research has examined how neighborhood-level changes in health behaviors impacts health outcomes. Bonnie, thank you so much for being here today. Bonnie Ghosh-Dastidar : Thank you Rosemary for that introduction. Pennington : Could you just take a moment to tell us a little bit about how you got started at Rand? Ghosh-Dastidar : Absolutely, so when I graduated from Penn State with a Ph.D., I realized that I was an extroverted person and that I wanted to be in a field where I felt I was having impact and that just meant than rather than being "upstream" or one could be doing theoretical work, my natural instinct was to be doing more applied hands-on kind of work, and I would be interested in communication and dissemination that is when I came up on Rand and its extensive portfolio of work, in health, criminal justice, social justice, the environment to name a few, and then I realized that that was probably a good fit for my interests. John Bailer : And it looks by some of what you shared with us that it's been a productive stop for you. We're really intrigued at this idea of the work that you've done at food-deserts. So, maybe just as a starting question, what is a food desert? Ghosh-Dastidar : So, John, a food desert, sometimes you'll see kind of covered in the newspapers or New York Times how they almost fairly popular topic food deserts are areas that lack access to affordable food, vegetables, whole grain and other kinds of healthy foods that make up the whole range of a healthy diet in the US. For example, 23.5 million people live in low-income areas that are more than a mile from a supermarket or large grocery store. That is to say that about 24 million people lack direct or immediate access to healthy food, in addition these neighborhoods are often swamped or saturated with small neighborhood stores which may carry foods that are considered less healthy, and more sweetened and processed foods that are not particularly good for your diet and health. Richard Campbell : I was going to ask: how do you make that distinction between healthy and unhealthy, when you're doing a survey like that? I'm thinking of a food like Frosted Mini Wheats. Which you put sugar on a whole grain. So, what do you do with something like that? Ghosh-Dastidar : Yeah. So, I think that's a good question and I think maybe one of the things that helps to get at that is "why does it matter? ", "why do food-deserts matter?" And how do you define healthy and unhealthy? Some of it is a little bit out of take and can be arbitrary, a little subjective, but in general I think what has focused interest in the issue with food desert is obesity epidemic that we have seen in the US. Some of statistics I've seen out of the National Center for Statistics is I think, about apparently 37% of the US adults have obesity, and in terms of dollar estimates, these are a little bit out of date as I would warn you, it was estimated about 148-billion dollars in 2008 US dollars. So, the idea being, ok obesity is an issue. People in low income areas, if you work and map this out, are having particularly negative outcomes, including high rates of obesity that are related to health conditions, and there's an extensive body of evidence that links certain kind of foods, like foods that are more negatively impact health outcomes, versus healthy foods which are the types of foods that actually positively impact your health. I think actually that broader classification that exists in the nutrition literature that we're using to classify foods that healthy, are less healthy rather than an absolute label like absolutely unhealthy. So, I think that you could maybe look at relatively what's good for you versus what's maybe less beneficial to your health. Bailer : Okay, very good. So, when you're doing studies like this, to look at the impact of food deserts on health, what are some of the ways that you explore that? Ghosh-Dastidar : So, in our case John, in particular what we've been very interested in is "what is being done around this food-desert issue to impact health outcomes?" So, one of the strategies that the government and policy initiative has focused on is to bring supermarkets to food-deserts to allow for greater access to healthy foods, fresh produce, whole grains or low-fat milk, things that we take for granted, many of us, just to have a better source for these types of foods in areas that have historically lacked access in the last 20-30 years. So since, for example one such policy initiative is the Healthy Foods Financing Initiative. Since 2011, the Federal Government has invested more than 500-million dollars to one-time funding assistance in efforts the opening of supermarkets in food-deserts. So, it's actually the kind of work that's being done. In our case what we pursue to do is to answer the important policy question like "do these policy initiatives have an impact ultimately on the outcomes we care about that is diet?" your food purchasing habits and practices as well as health outcomes such as BMI, body mass index, and obesity. So, in order to do that what we've done is focused on rigorously designed studies, that can help us get at more direct evidence at answering this question as in if you transform a food desert, if you try to put in place both initiatives to help these food deserts which have become so important across the landscape, then what is the outcome? And mind you, the policy initiative that I mentioned and our Healthy Foods Financing Initiative that's actually quite big in Pennsylvania, this is part of the initial, Obama's sort of broader policy outreach to ensure equity in foods and healthy diet across the country. Pennington : You're listening to Stats & Stories where we discuss the statistics behind the stories and the stories behind the statistics. The topic today is statistical research into health behaviors and outcomes. I'm Rosemary Pennington and joining me are panelists, Miami University's Statistics Chair John Bailer and Media, Journalism and Film Chair Richard Campbell. Our special guest is Rand Senior Statistician, Bonnie Ghosh-Dastidar. Bonnie, you were talking about your work on food deserts, and I'm wondering if the work that you're doing, I'm assuming on these deserts that exist now, is giving you the tools to be able to predict where these kinds of deserts might develop in the future? Ghosh-Dastidar : So, Rosemary, to be honest that's not exactly our work, although that is interesting and that work exists. Our particular focus is really what we've done is taken two food deserts in Pittsburgh, Hill district and Homewood and designed a natural experiment to understand and follow a neighborhood would change. To look at it pre-intervention and then look at when a supermarket opens and how that transforms and compare it to a control community where there is absence of a supermarket throughout that period, and compare the two to understand in a more rigorous setting, as to is opening a supermarket ultimately good for the neighborhood and its residents. Bailer : You know, you're using terms that are common in some groups but maybe not so familiar with others. So, I'm going to ask you to define for our general listener, what do you mean by designing an experiment, so what does design mean in this context? And you also said, "Natural experiment". So, just kind of expand on those two points please. Ghosh-Dastidar : So, the design of experiments suggests that can you create a setting where you can attribute the effect of a change or an intervention in this case, the intervention being neighborhood level change, to bring in a supermarket in an area that didn't have one then you design sort of a rigorous setup such a setting mimicking something that you would do in the lab so that you can say that the influence of the supermarket and people's health, then we pretty truly are clearly attributed to that change. How we did that is if you work and do it in the lab it was far easier where one condition, would be turned on, one group would receive the intervention, and the other group wouldn't. In neighborhoods this is far harder because neighborhoods change, and sometimes you can't randomly assign one group to get a supermarket or not, they're often other factors that come into place. So what we did was identify a prospect in the Pittsburgh area, where a historic neighborhood without a supermarket for 40 years was going to gain a supermarket, and so what we did was identify, using statistical method of matching neighborhoods, we actually looked at different control neighborhoods or comparative neighborhoods, and then what we said is "all right here's this matching neighborhood which is not going to get a supermarket and let's follow people in the neighborhood over time". Look at their diet, purchasing behaviors and health outcomes over time and then put that in direct comparison to the neighborhood that gets change and see whether people there in the intervention neighborhood are benefitted by the opening of the supermarket. Campbell : And you have a really interesting finding, right? You found that the diet improved, right? But it wasn't because they used the store, right? Is that true? Ghosh-Dastidar : Richard, so yes so the fact is that something was a bit of a pragmatic trial, right? Because it's not a lab setting and sometimes you get very mixed results. So, our study was one of the largest natural experiments, in the sense why an experiment? Because they have a control group that doesn't receive the intervention it's called a natural experiment, which the idea is that it's kind of like an experiment but we didn't pick the neighborhood that got the intervention. So, in this setting, and we had a good number of residents involved in both neighborhoods. We did find that those reported eating fewer calories, less sugar, they had much better perceptions about their neighborhood and that even those perceptions seem to matter for people's health outcomes, like, "are you more satisfied with your neighborhood? ", "Are you feeling more positively? ", that positivity also seems to matter ultimately for health outcomes, but when we looked we actually captured shopping behaviors. We've tracked these people over time and when we looked at those that were using the supermarket regularly, versus those that weren't, the story was not so clear. People who were using the supermarket frequently were not the ones with all of what we see as positive change because their diet had moved in a healthier direction, according to nutritionists. Bailer : So, have you been able to replicate this? Or will others replicate this sort of study in the future do you think? Ghosh-Dastidar : You know John, I think replication is really important. There have been at least two other studies before this, and they have not found an outcome that we have in that sense, there's a real focus and interest in ours. So, it would be great to replicate it in other neighborhoods in other contexts. The other part is I think the evidence now is building up where there's more and more consensus that opening a supermarket is not going to have sufficient impact, you know? To have the kind of impact on health and diet that we want and then the hard part is that we actually have continued, we applied for a grant because what we realized was everything that hypothesized about this big linear transition, getting a supermarket, they're going to start using the supermarket the outcomes are going to get better, didn't play out. So now we're looking at alternate mechanisms that you factor in socio-economics. What does, kind of opening a supermarket do? To income and other sorts of optimism and hopefulness and maybe ultimately changes your knowledge and attitudes about diet, so we're looking at alternate mechanisms that could be influencing the outcome, because we found the use of the supermarket is not what mattered? And then we are also, given that you know, our findings happen, our findings were measured directly after the supermarket opened, we're also tracking these residents over a longer time, to see a long-term effect. But also, to see a more stable effect, because you know, right after a store opens, you know, some people who have better intentions or higher intentions may show up, some may not even be fully aware. They may be creatures of habit not switched over, so, over several years I feel like we may have a better chance at depicting what is a more stable effect of such a change. Bailer : So, it sounds like your work has challenge somewhat, this public policy initiative. So how has it been received? Ghosh-Dastidar : So, in general the National Institute for Health, which is our funder has been very interested in results, and in pursuing or investing in further work, as far as the policy environment goes, people are both very enthusiastic of the outcome but they also realize our message has been that the analysis and evaluations around these neighborhood changes are fairly complex. One is it's a neighborhood level change. We are not actually investing in people directly to you know, whether they adopt the supermarket or not, so those individual level interventions are different than neighborhood level interventions where you place the supermarket but ultimately have no control over people's views. So that's one aspect to take that a neighborhood level change, both hard to measure and kind of define what is exposure of people. the second thing that we're doing John is understanding better as to how to capture people's exposure to the supermarket, like "are we doing a good job? ", "have we asked the right questions about who's a user and who's not?" and then the third part is from the policy side we also examine other aspects that maybe influencing people's sort of attitudes and diets etc. for example the food environment, what we are finding is apart from opening this up advertisement, pricing of food, all of this can be really important factors in what drives people's decisions, so we've started a message that the story is much more… even though there's promise, it's far more complex, we need to explore alternative mechanisms in the neighborhood and something so simple as just placing a supermarket and expecting that things will change exactly the way you want, it's perhaps a little bit naïve or should not be expected to be replicated. Perhaps some other studies are needed. Replication in a larger scale study multiple neighborhoods I think will always be really, really welcome to see if you can find the same sort of outcomes or improvement elsewhere. Pennington : You're listening to Stats & Stories and our discussion today is looking at health research. Bonnie, you mentioned at the beginning of this conversation that you wanted to work at Rand because you felt like maybe your research can have impact, you're really interested in the implied aspect of research. So, how do you know if the research you're doing on HIV or food deserts or other things is having an impact? Ghosh-Dastidar : So, Rosemary this is a daily struggle. Research, by definition is a little bit sometimes separate from people, I think that's just my image of a researchers, a little bit introverted a little bit at their desks. Part of the reason that I'm doing this podcast today is I'm thinking, "well, that's a way to get the message out of what our work is about. The fact that these neighborhood level changes in intervention are both difficult to measure and complex as they play out, there's changes that are often simultaneous. A lot of other things could be changing in people's lives, in neighborhoods, right? The other part of impact is that we try very hard at Rand, we have different groups and departments that help us get the message out to the public you know, be it to Congress, do regular sort of meetings and briefings, we try to get the word out through discussions to stakeholders. In this particular study in Pittsburgh, we also have a great deal of community engagement that I think is extremely important for researchers to get the message out. Because not only do you want to study this population, you want to think about how are you helping them right? What is it that they want to learn? What is it that they want to achieve for their community? So, having that partnership of the community based participation research and go through the study has ensured the success of the study. We have very good retention, we are able to track people for a very long time but again, to both have the input and provide feedback and just kind of you know what kind of questions should we be answering? What is happening, qualitatively in the community? I think that's really important. So that level of impact I think is what's going to shape how this work gets put into practice and the impact of this ultimately is how it helps people living in this community. Campbell : So, Bonnie part of getting the word out to the public is going to depend on how journalists interpret your work and how they reflect that in the stories they tell, so how did that work out? Because the findings in this are kind of complicated. I mean I, this could be misread in a number of ways I would think. So partly what I'm asking for are sort of tips for how journalists can do a better job and how this work was interpreted by journalists. Ghosh-Dastidar : Yeah, so Richard, just recently I did an interview, and then I stepped back for a podcast in journalism because the podcast part of the message was almost too complicated. So, I was a little bit almost fearful that I would misstate. But, that's really not a good reason to step back, to open and engage in more discussion. It's better to, for example what we've said is that our work shows some positive impact - opening a supermarket is about equity and social justice, you know, there's equity in food access, I think is a powerful motivation in itself but beware, these outcomes don't react to the reasons that you would expect there are other things going on. So, until we can do that, until we can replicate these results, until we can- this next grant we're looking at what has changed simultaneously; we're collecting all kinds of measures in the neighborhood - simultaneous investment, people's attitudes and people's sort of issues of hopefulness. So, we have an outcome, but we don't understand why it works, that means that this policy initiative did not play out the way it is supposed to, so I think we've put out the statement that this health policy initiative just as it is is not going to work, that message was clearly put out, but why it works in impacted outcomes in alternate ways is not understood and that's why I think that replication is really important trying to have identifying an alternate mechanism. Until we do that there's actually no rest so the message is nuanced but I think it can still be made. You know, there are pieces that are more black and white and from that we have to separate a very kind of optimistic sort of naive solution is not going to work I think in this case. To improve something as difficult to change as people's diet, you know? Bailer : You know you hit on something that I was curious about, and that is some of the other variables that might be important, some of the confounders that are in the community. I would wonder if perhaps the presence of the grocery might matter to people of a certain age versus other people, you know maybe it's more important for older consumers than younger consumers. Maybe the presence of certain fast food restaurants might make it so that it doesn't matter if you open it or not, for certain groups. I can easily imagine that there are lots of other really important factors or variables in play that might determine whether or not this is an important addition to a community for some members of that community. Ghosh-Dastidar : Yes, that's right John. And I think the one thing that you point out that many times true for population health is there's also not a one size fits all, the point you're making is are there certain segments of the population that received particular benefits. Maybe segments that are not able to leave the neighborhood right? That don't have access to a car. That perhaps are at a particular disadvantage because they had no means or limited means to get out of the neighborhood and that's exactly the sort of analysis that we are doing now is looking at the effect in different sub-groups. Some of the more obvious ones like age groups like household with and without children we have some male respondents who are primary food shoppers and the rest are women but they compared males to females, we haven't found a clear pattern that we would like to have found because that would make it for a nice tight story that you know, we found an impact on this particular group this set of data and this set of results is just proving to be really hard in that sense but now we're looking at more sort of subtle type differences or other sort of distinguishing factors that may have some clues as to why did the diet improve overall? We're also going to do another round of data collection this year, 2018, starting around May into the fall. And then we'll see if it's sustained. You know whether this was just a blip that the immediate short-term effect of the supermarket people were positive or something that happened that even was anomalies; mind you we did use pretty stringent measurement protocol in the 24 hours diet recall but diet is notoriously hard to measure, you know? So, we are doing additional measurements to see who's within the same group and can this be replicated. Because I think, John, you mentioned the word replication I think that's important to understand. Are these findings consistent and do they hold when assessed again? Bailer : Really interesting challenges that you have there. One of the things that you talk about whenever you're doing this type of work are the limitations that studies have. And some of the challenges of trying to attribute the intervention as being causally impacting some endpoint. Can you talk a little bit about some of the limitations to the studies that you conducted here and why is that important to communicate? Ghosh-Dastidar : So, John, are you in particular alluding to the fact that this is a natural experiment instead of a random experiment and what are some of the limitations of it? Bailer : I'm lobbing to the net and letting you slam it any way you'd like, Bonnie. Ghosh-Dastidar : Ok. So, some of the really hard questions here, so mind you when you're wanting to attribute change to something to an intervention to an investment then you need to argue that this change was not just a time trend, like because a lot of things are simultaneously changing over time, attitudes and beliefs and even knowledge about diets right? Maybe even national obesity trends are flattening so having this control and intervention neighborhood of making sure they're well matched was important. But then imagine what's going to be observed or known about this groups like we know that both of these neighborhoods are predominantly African-American, but 93% are African American. We know that they're similarly matched in age groups but there are other differences about people than dry behaviors and outcomes and the point is, one that we can question what matters, or several key questions that can matter, is from a statistical perspective is that's what I would call study design how well the control and intervention communities are matched and you know how well are they comparable and that's where there are statistical tools and methods like propensity scores or econometric methods like instrumental variables that we are playing or working with to see if you analyze a certain data in different ways will you still have the same results and that is a kind of replication but now the replication is being subject to different kinds of tools that we have as methodologists in our power. We're also very curious as to whether our measure of exposure is sufficiently sensitive, meaning did we measure the use of the supermarket sufficiently well? Are we measuring the change in the neighborhood if we're just calling one intervention control but there's so much else that could affect people's access to the supermarket? So, are we picking that up? So, we're developing better measures of exposure. The other part we are doing is as time goes on neighborhoods will change people will change so in this new grant we have been collecting information and data using secondary sources like housing permits in the neighborhood, looking at public investments at newspaper articles, what changed in these two communities at the same time? We know simultaneously that quite a bit of housing investment has been going on in addition there's been some investment in green space and parks and playgrounds, so to understand how to incorporate both and derive these measurements but then to be able to model these simultaneous changes that are happening in these neighborhoods and then to be able to connect them to people as well as to make sure that people's exposure to these neighborhood changes are sufficiently sensitive to pick up I think are interesting details and that's where we're at in looking at different ways to analyze their data. And then to see are our results robust, as in will they still hold up to scrutiny? Pennington : Bonnie that is all the time that we have for today. Thank you so much for joining us. Pennington : Stats and Stories is a partnership between Miami University's Departments of Statistics and Media, Journalism and Film, and the American Statistical Association. Stay tuned and keep following us on iTunes and Twitter. If you'd like to share your thoughts on the program, send your emails to statsandstories@miamioh.edu . And be sure to listen for future episodes of Stats & Stories, where we discuss the statistics behind the stories and the stories behind the statistics.